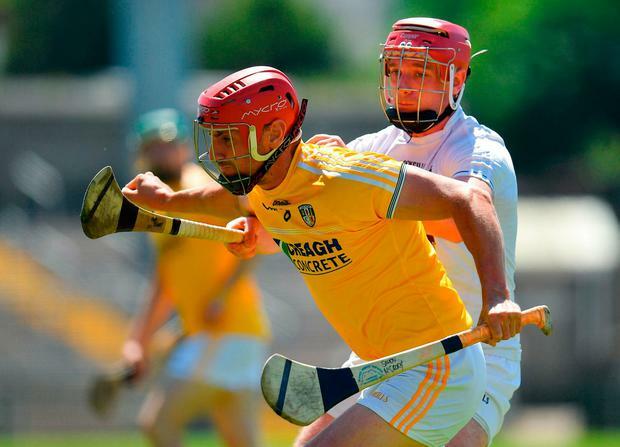 Antrim easily brushed aside the challenge of newly-crowned Christy Ring Cup champions Kildare to retain their Joe McDonagh Cup status at Armagh's Athletic Grounds yesterday. 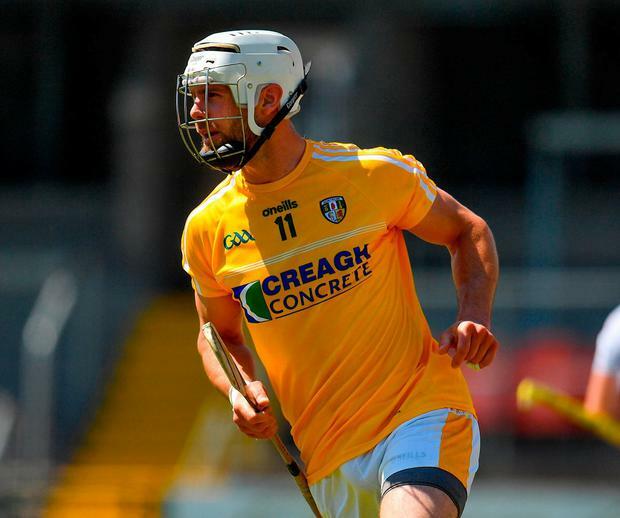 First-half goals from Neil McManus and Conor McCann helped Antrim to a 3-9 to 1-9 lead at the break after Paul Divilly had goaled in the third minute to give the Lilywhites an early advantage. 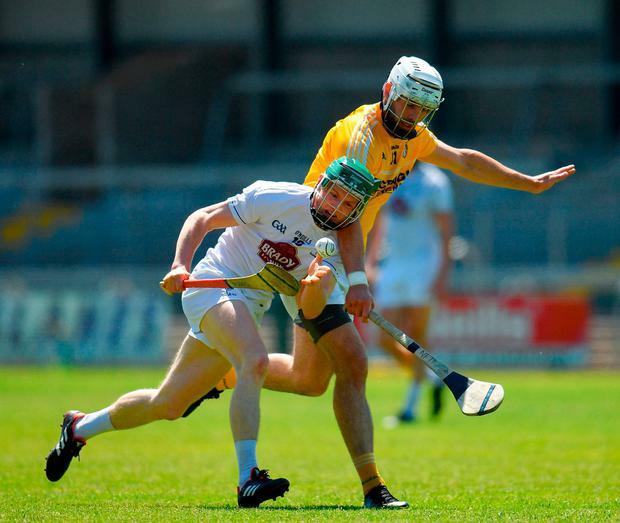 Once Antrim found their rhythm, however, there was only going to be one winner and the Saffrons continued to tack on the points throughout the second half. McManus was, once again, tormentor-in-chief for Antrim, finishing with 2-10, while Keelan Molloy finished the day with six points from play. The sides were level twice in the first half, on 11 and 16 minutes, but Antrim outscored their opponents by 3-17 to 0-6 thereafter. Scorers - Antrim: N McManus 2-10 (6f, 1 '65); K Molloy 0-6; C McCann 1-1; N Elliott 0-2; R McCambridge, J Dillon, E O'Neill and J McNaughton 0-1 each. Kildare: P Divilly 1-6 (2f); J Burke 0-6 (5f); K Whelan and B Deay 0-2 each; C Bonus 0-1. Antrim: R Elliott; A Graffin, J Dillon, R McCambridge; P Burke, M Donnelly, C McKinley; S McCrory, E Campbell; K Molloy, N McManus, N Elliott; C Carson, C McCann, E O'Neill. Subs: D McKinley for R McCambridge (50), J McNaughton for M Donnelly (63), E McCloskey for E O'Neill (65), S Rooney for S McCrory (70), D McCloskey for C McCann (73). Kildare: P McKenna; C Gordon, J Doran, P Sullivan; E O'Neill, M Maloney, K Whelan; N Ó Muineacháin, B Byrne; J Burke, P Divilly, B Deay; M Delaney, M Fitzgerald, J Sheridan. Subs: C Bonus for B Deay (53), D Cahill for K Whelan (53), S Gainey for J Burke (56), B Cormack for M Delaney (60), S Walsh for E O'Neill (68). Michael Verney If Aaron Gillane's reaction to watching back Limerick's comprehensive league final defeat of Waterford is anything to go by, any side meeting the Treaty should tread carefully. Independent.ie Sportsdesk Laois hurling boss Eddie Brennan has been handed a significant boost before next month's Joe McDonagh Cup commences with Ross King returning to the fold.